Chiang Mai is definitely on the banana pancake trail “Chiang Mai – Chiang Rai – Golden Triangle”, says pretty much everyone I’ve talked to about their first (and usually only) visit to the Kingdom. It’s a mantra, a package, the chorus of a well known song. I’ve read blogs that argue that CM is overrated, others that claim that it’s the best place on Earth for expats and digital nomads. For me it was my first stop in Thailand, and that alone makes it special) It is also the place where it dawned on me that, in travel, less can be more. Indeed – I stayed for six full days in Chiang Mai and got very little done by most people’s standards. No – no Golden Triangle. No elephant rescue center. No jungle trekking. Definitely, no tours. I did get my first Thai massage, though. And got to hang out with a Thai girl in true farang style at infamous Zoe in Yellow. But that’s another story. Instead of following the A-side beaten track, I rented a gear bike and cycled around, taking in temples, markets, bars and some great nature a few kilometers away. I am not claiming anybody should do like me. I’m just sharing the fact that it did me well. But there probably is a time for each travel style, and Chiang Mai will cater to most. Maya shopping center, to be specific. It so happened that I left many of my clothes behind in a cheap hotel in Kuala Lumpur, so was in desperate need of buying some boxers. Back then I hadn’t yet discovered Thai street markets, so nearby Maya mall was the obvious choice. Now, once I ascertained that the lady at the information desk was not especially helpful, it was truly sanuk to ask here and there for underwear to people that barely spoke English. The giggles I got from a group of teenage sales reps were truly priceless! In the end, I found a store that sold them – not especially cheap, as you might have guessed! Yes – even in farang-packed Chiang Mai it’s easy to end up in interesting places and be the only Westerner around. It happened to me on the way back from the train station, which is quite a distance from the historical downtown core. 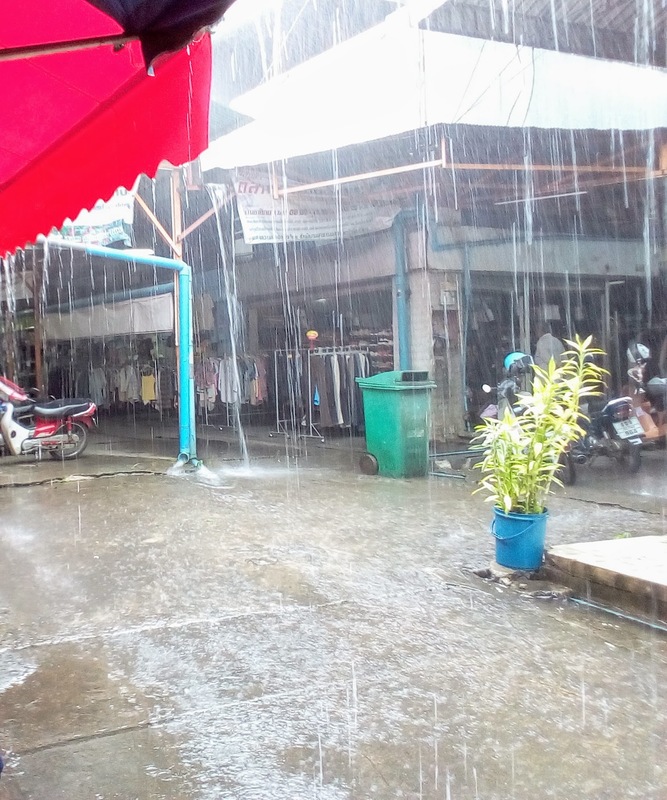 I’d biked there in order to buy my overnight sleeper train ticket to Bangkok, and as I was returning on the busy Charoeng Muang Rd, I was surprised by a true tropical downpour. Fortunately, I was able to seek refuge in a nearby market (which, on later investigation, turned out to be San Pa Khoi). Once inside the market, I walked around and enjoyed some tasty snacks, then moved on to the clothing section, where I discovered a couple of stalls selling vintage clothing – cheap stuff, not the overpriced delicacies that hipsters like to sport. I tried on a couple of shirts, but they were too tight. Doh. “Dee mak!” (very good) I called enthusiastically, my two thumbs up. Needless to say, I got huge smiles in return. Chiang Mai is just the place to sip coffee and let the world mind its own business, somewhere outside. Beautiful, stylish cafes serving good coffee and, one thing that I truly love, patronized by a healthy mix of Thais and farang. Of all of them, quiet Cafe Barkao wins my award for best B-side cafe. No wonder Chiang Mai is digital nomad capital. Who the hell wants to blog without a cup of freshly-brewed coffee ready to hand? Tired of all the urban pleasures Chiang Mai has to offer, yet skeptical of the possibility of hiring a tour to get out, I did some quick research on the Internet and headed my bike toward this quick but scenic getaway. To my pleasant surprise, after negotiating heavy traffic on a double lane road, I was soon cycling on a bike path almost all the way until the detour to the lake. I parked by bike close to a Buddhist shrine and followed by gps track onto a singletrack trail up the mountain. I was sweating, but truly enjoying the scenery, which soon felt beautiful and remote. My plan was to do a loop hike, but after about an hour of solitary and strenuous climbing, the path got so overgrown that I got second thoughts about it. What if I was bitten by a snake? How the hell would I get help? My conservative side got the best of me and I decided to run back to the trailhead. At some point I heard a dog barking. A stray dog, maybe? Now I was running even faster! I then leisurely biked around the lake. It was a weekday in low-season and there were virtually no visitors. I had a glorious iced-tea in one of the restaurants. On the way back, a huge rainstorm collapsed on me, but fortunately I had protected my backpack with a garbage bag. Mai bpen rai.